Enjoying beautiful views of the sea as well as superb sunsets over the heated infinity pool, Villa Seburga is a multi-million Euro property in a dominating hillside position close to the medieval pedestrian village of Saint Paul de Vence, one of the most exclusive locations in France. Just 12 minutes from Nice Airport, yet far enough away from the crowds and traffic to enjoy a tranquil countryside setting at a pleasantly higher altitude in the Alpes Maritimes. 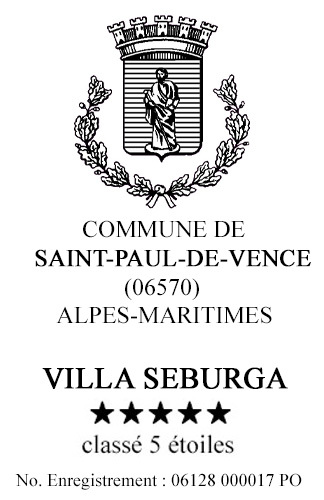 Many villas in and around St Paul-de-Vence are in the valley below or in some peripheral 'quartier'. Villa Seburga, on the other hand, is set on the prime location hillside at a higher altitude than the village itself - offering secluded tranquillity - and stunning views for up to 50 kms. Villa Seburga is located just three minutes drive to the old town, or a scenic walk takes you there in just 15-20 minutes. There is parking on the property for several cars. Relax in our luxurious property, enjoy the privacy of Villa Seburga with its extensive terraces and amazing views over the Mediterranean and 50 kms of countryside below. Dive off the springboard (or glide down the new water slide) into the heated infinity pool, sunbathe on the secluded terraces and enjoy a sumptuous meal or BBQ in the evening on the dining terraces. With a total of 20 spacious rooms, including 5 bedrooms/bathrooms on three levels, guests can enjoy 'their own space' or join each other in the large communal areas, both inside and on the outside terraces. If you can't bear to be left out of the loop with developments back home, Villa Seburga has its own business centre with Wi-Fi internet for your laptop, colour laser printer, fax, scanner, electric paper shredder and super comfy ergonomic chair from Herman Miller. Important to Note.....There are 2 rental options available at Villa Seburga. Villa Seburga can be rented for up to 10 people. Five bedrooms and five bathrooms (Total 20 rooms), which includes the Luxury Pool Apartment, which is opened up as part of the villa and exclusive use of the gardens and heated infinity swimming pool. Click Full Screen to Play "Aerial & Overview"
Click Full Screen to Play "Bedrooms & Bathrooms"